"great job, prompt, excellent value for a thorough job. "Great service, kept up to date and turned up on time. Great price contact and work. "I am extremely happy with the work of Discount Drainage. Leigh Tuuta contacted me on the day of my inquiry, and arrived the next day to measure and quote. He even tried to clear a pipe on the spot, but it was clear a relaying of pipes was required. His quote was fair and very competitive, and the team arrived the day after the quote was accepted. They were efficient and courteous, and worked almost non-stop to complete the work (sewerage and storm water relaying) within a day and a half. They… cleaned up afterwords and even replanted plants that needed moving. They returned on the next working day to complete the clean up. In my case they required no upfront payment, and the invoice arrived days after completion. I would certainly recommend Discount Drainage to anyone needing drainage work, and would use them again if I needed similar work done." "Thank goodness for Discount Drainage! We had a sewage backup that rendered the toilet out of order, but worse, had amassed a sewage pool around the exterior piping right outside our house ... yuck!! I called DD in the late afternoon and they were there the next morning first thing. They cleaned up the toxic pool and unclogged the drain. After very prompt consultation we decided on a plan and as soon as I gave the go ahead they were back on site to cut away the roots of the tree - aka the… culprit. On request they provided me with a detailed quote for fixing the problem long term by replacing the old clay piping. I can't recommend this team enough - they've been super efficient, courteous, helpful and sooo reasonably priced. I feel very lucky to have stumbled upon them and will definitely be getting them to do the drain refitting in the future. Don't hesitate to call Discount Drainage. Thanks DD!" "We received very prompt attention from Leigh and the team. The communication was excellent and they explained everything very well. After digging around and completing the inspection they left the area very today. "it is such a pleasure to provide feedback and to be one of so many clients that are a 100% satisfied with discount drainage's services. They provided first class communication and coordinated, performed and finished the job to a superb standard. They even left the work site more tidy than it was before. As a contract manager, I can't praise this business highly enough.Thank you team :D"
"Really happy with the overall experience. They arrived, got into what they had to do. The workmen were pleasant and the job was finished and tidied up by the end of the day. Can't ask for more than that." "These guys at Discount Drainage did a great job, good communication, turn up when they promise, tidy site. This is the second job we have had done by DD...thanks guys." "Quick response and great service!" "came to fit two drains and galleys in my back garden to remove surface water that accumulates after heavy rain. They did a quick and efficient job and left the garden in a clean and tidy state. very pleased with their work." "The company was professional and finished the job to a very high standard. Even to ensuring the driveway was swept and hosed down leaving my place better than it was before they started the job. The workers seemed to understand this level of commitment to the job was an essential part of the service even though it was outside the replacement of drainage pipes parameter." "from first contact for a quote the lads arrived when they said they would. Then on the day of the job being done they were bang on time as told to me and they just got on with the job. Very professional and efficient and also lovely guys to deal with, easy to talk to. We are very very happy with their work and would recommend them anytime. Also want to say that the office girl Stacey is a delight to talk to and also very efficient. Brilliant job gang"
"Fast and efficient service, did what they said they were going to, very reasonable price and happy to send the bill which suited as i was away in Auckland at the time they did the deed. Provided same day report and CCTV inspection clarifying what the issue was. Would highly recommend will definitely be using again if required." "Aubrey and his team have done a lot of jobs for us. They are fantastic to work with, are reliable, prompt and efficient and go the extra mile when needed." "Excellent communication, turned up as agreed, did a good job, and the rates were reasonable. I recommend this firm." "I found these guys great. I had a biggish job with damage to stormwater and sewage pipes from the Canterbury earthquakes which needed replacing. I was therefore expecting a huge mess around the property and destruction of my gardens. It was a muddy mess at times due to heavy rain, but it was managed well. I am very pleased with how little sign of excavation there is and how little foliage needed to be cut back. They were careful and respectful and did an excellent job tidying up. Really great… people to communicate with, both in the office and the team at my house. I can highly recommend this company." "Great service, prompt to come to look and quote, good advice, then the job was promptly and professionally done." "Great job. arrived on time, even a few days early than anticipated. Job done very well they explained everything to me as they were doing the job, and showed me the camera under ground and what it was showing. "Aubrey and his colleague did a good job on clearing our blocked drain." "Arrived promptly and sorted out the blocked sewer drain quickly and efficiently. Very happy with the work and price." "Excellent Service. Discount Drainage Ltd were round to sort our blocked drain within a couple of hours of my call. As the job required a replacement pipe, they were onto the job immediately the next day. Both times they were here at the time they specified. Very fast, friendly and efficient in fixing the pipe, worked very tidily, laid lawn back exactly where it had been, and even swept the mud on the drive from their muddy boots. Would definitely recommend their service." "Great service from this company. After another drainlayer had been unable to remedy the ongoing problems with the sewer on our property, Discount Drainage accurately diagnosed the problem and replaced the damaged sewer. The work was done efficiently and with minimum fuss and came in under budget. The staff were helpful and hardworking (despite having to work in the cold and rain) and went the extra mile to clean up and make good after the new sewer had been installed. THANK YOU." "We were recently cash settled by EQC for damage sustained to our drains from the Chch earthquakes. We sent our Scope of Work to Discount Drainage in order to get a quote. Not only were we pleasantly surprised by their quote. They also went further by completing a variation for further damage they discovered. Discount Drainage made everything simple and the work they completed was outstanding. Our property actually looks better than it did before the repairs. I would recommend Leigh, Aubrey and… their team to everyone looking for quality drainlaying work at an affordable price." "A great job relaying all our storm water and wastewater pipes and removing the old ones. Friendly staff, recommend to all. Thank you." "I had a blocked drain over Easter and Aubrey came out on Easter Monday to clear it for me and clean up afterwards. I will be recommending Discount Drainage to my friends"
"We had a blocked Sewer Drain, I rang Discount Drainage and they were able to do the job straight away as their truck was nearby. Within an hour they had cleared the blocked sewer and hosed down the mess. The charge was reasonable and it was a dirty job so I would of been happy to pay more." 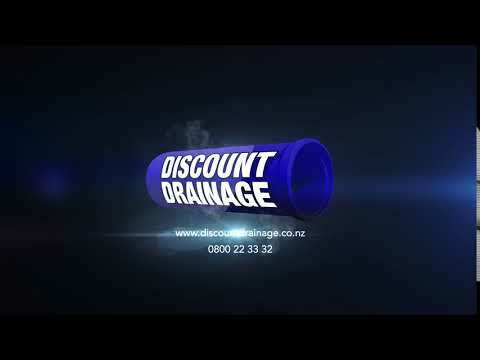 Aubrey & Leigh Tuuta, & their team at Discount Drainage Ltd pride themselves on providing value for money, quality solutions to your drainage problems.